When Father’s Day rolls around, kids and adults will often angst over what special food to celebrate with their Dad. Since 2008, I’ve spent the Saturday prior to Father’s Day Sunday teaching barbecue classes. For my Big Day, I like to keep the festivities simple. I don’t need a fancy 7 course tasting meal . 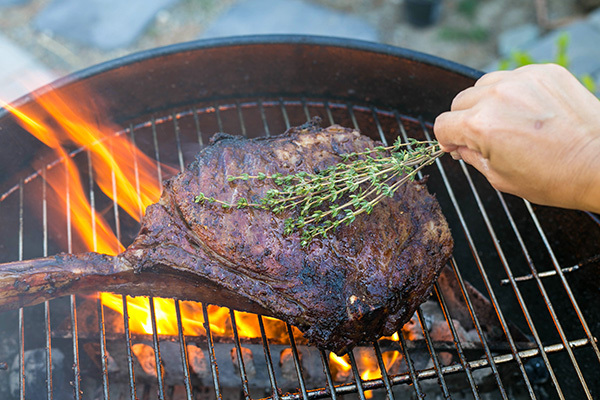 . . just a straightforward grilled steak at home, at the park, at the beach, or at a restaurant will do the job for me. 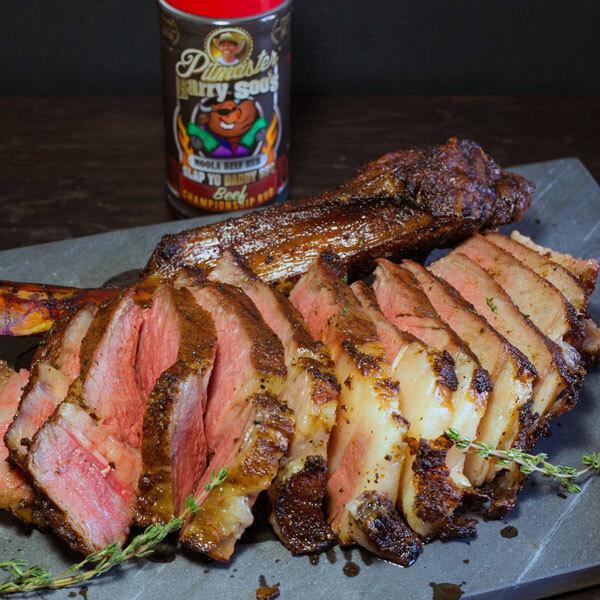 If you want to wow that special Dad with a unique and memorable jaw-dropper steak that looks like a million bucks, you need to find a Tomahawk Ribeye (and a BIG thanks to SRF for sponsoring the meat for this recipe). Not just any, but the best one from the Internet from Snake River Farms. 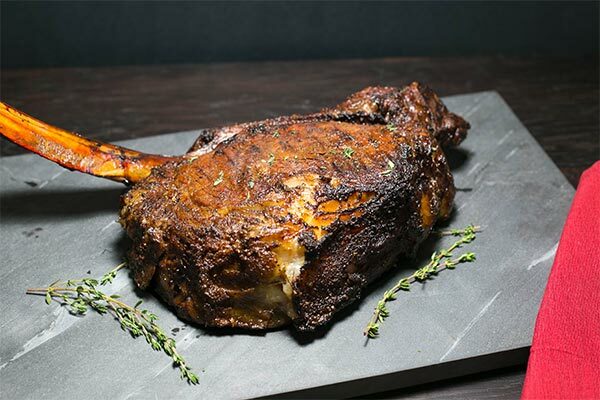 Their American Wagyu Tomahawk Steak Package is a pair of 2.5 lb. 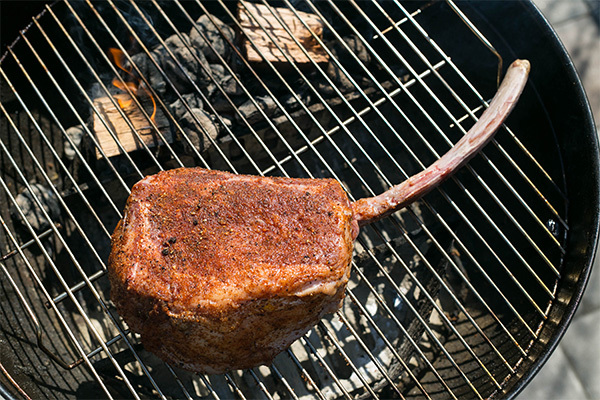 long-bone steaks that arrive in a gift box on your door step (singing angels optional). In case you’re wondering about their quality, these beauties are grade BMS 6 to 8 which is, to the lay person, higher than USDA Prime. 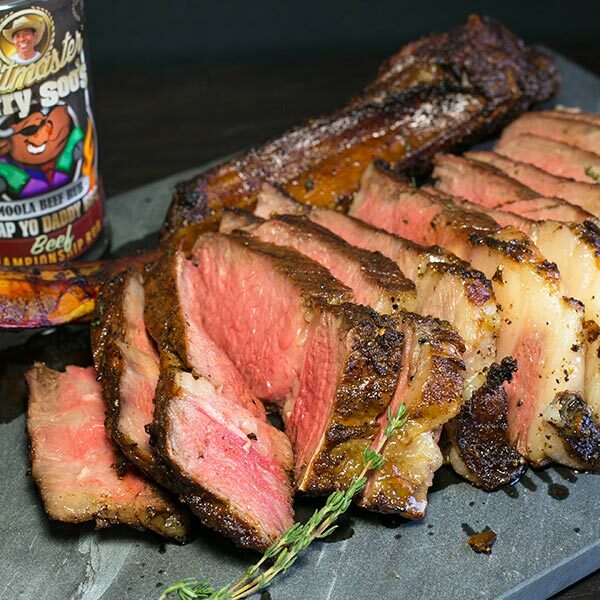 My vision of steak nirvana involves four specifications: 1) well marbled, tender, and flavorful beef, 2) kissed by smoke but not too much, 3) perfect char, 4) flavorful seasoning with a strong peppery finish. Number one is achieved by using SRF meats. Two, smokiness is accomplished by smoking the steak first from 34F fridge temp with a favorite wood (I like pecan) until the internal temp is about 110F. Three, the steak is finished off over direct heat until 128F internal for medium rare or the doneness you like. 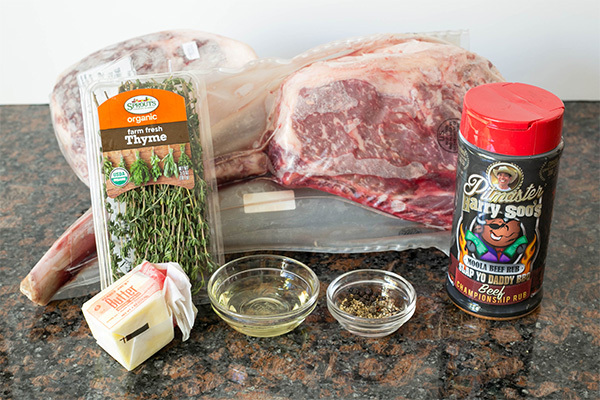 Four, using a Championship beef rub like my Moola which helped me win first place KCBS Ranchers Reserve Beef cup two years in a row in 2010 and 2011. My Moola has ground Shitake mushrooms, powdered Worcestershire, and other secret ingredients. The pepper note I’m currently playing with is a Madagascar pepper called Tsiperifery which I read in a BBC online article. It surfaced into mainstream culinary circles about 5 years ago. It’s pronounced French-style “tsee-pear-fair” and this wild pepper grows on vines up to 70 feet high on the island country of Madagascar off Africa. Compared to normal pepper, it has a stronger and hotter citrus pepper flavor that lingers. 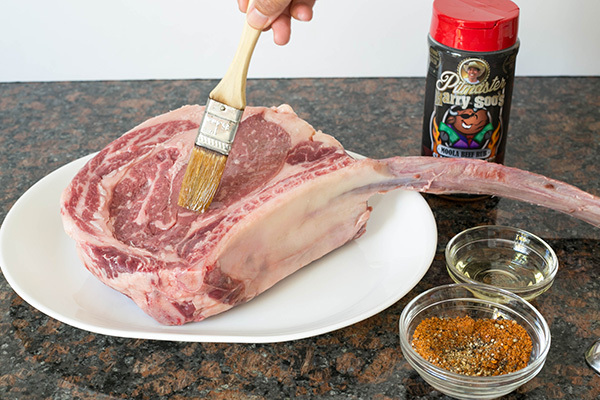 For big steak like a Wagyu Tomahawk, I think it works superbly well. It’s not easy to find (I found mine online at Madessence.com) as word has it that only 3,000 pounds are harvested each year. So if you can’t find Tsiperfery, don’t fret as regular course grind black pepper works also. 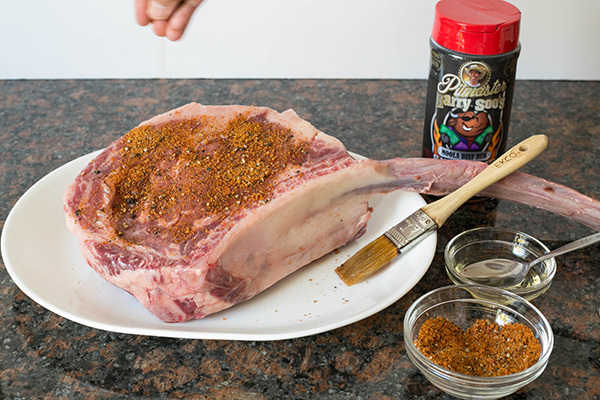 I layer it on top of my Moola rub so it supplements and enhances the strong pepper note already in my rub. Place into 275F pit on the indirect zone away from the fire. Add some wood chunks to get some smoke flavor (I used pecan chunks). Move the steaks over the direct zone to get a char. Brush on the melted butter using a few thyme sprigs tied together as a brush. 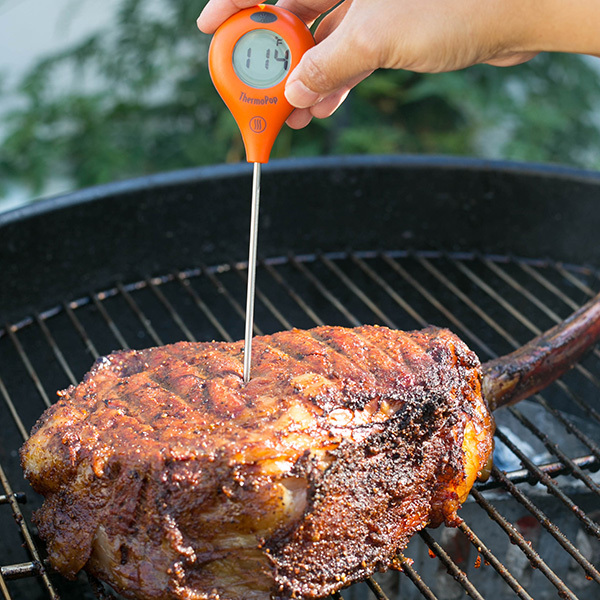 Remove when medium rare (about 128F) or the doneness you like.